This article is going to show how I redesigned my home network to serve some new purposes. Two Networks (both with Wifi and Ethernet). Segregation for the IoT Network. Devices should not be able to access anything on the Main Network. IoT Network needs to be on a permanent VPN (this is for using geo-restricted services such as BBC iPlayer). IoT Network traffic should go through the VPN. Main Network traffic should go via my normal ISP. No VLANs. I don't want to spend a tonne on new hardware, so I am planning to use existing hardware I have, most of which will not support VLANS etc, so I decided to just avoid them completely. This does mean my setup is simpler (IMO). Have a fail-safe management network for troubleshooting I may come back to this later. I have a tonne of hardware around the house, so ideally I didn't want to buy anything. I will outline what I have used, but most of the devices are standard devices so anything should do. I did buy a Ubiquiti EdgeRouter X as the central point of the network. This is an inexpensive and highly flexible device that I strongly recommend. It is the only non-generic device used in the guide below. Below is a crude diagram of my desired network. The obvious part that is missing is a modem between the EdgeRouterX and "The Internet", but I don't feel it is relevant to this particular scenario. I am actually using the router/modem supplied with my internet connection here. All I did was put it in Bridge Mode so I was not double NAT'ing. This means that the Eth0 interface on the EdgeRouter X was given an IP address from my ISP. Rather than try to set this all up in one go, I decided to break it down into steps and get each part working correctly. There are plenty of basic setup guides for the EdgeRouter X and I really don't want to repeat them in detail here, so I will just give a rough outline here. This will load the web interface of the EdgeRouter X. Once logged in, it is useful to start with one of the Wizards. This sets the basics up for you. The wizard has created a switch which joins Eth2, Eth3 and Eth4 together. You can keep this setup, but I am going to remove it. Here is a a video summary of the previous section. The wizard has left us with two internal networks. This setup might be what you want, but I do not want the switch as I want to only use eth2 for the 192.168.3.0 network. This is how we go about removing the switch. Connect to the 192.168.4.0/24 network. Remember to alter the DNS forwarders to remove switch0 and add eth2. This is done in the services section of the EdgeRouter X config. As I mentioned above, I am using two random home routers as Wifi access points for each network. I do not think it would be valuable for me to go through the configuration of each router specifically, but I will outline some key points here. Each router/access point should have a statically defined IP address within the range of the network it is connected to. Each router/access point should be in Access Point mode (if applicable). In my case, the Asus RT-AC3200 has an Access Point mode, but the Netgear DGND3700v2 does not. This doesn't particularly matter as long as you configure it correctly. Cables from the EdgeRouter X should go into a normal switch port on the access points (not the internet port). DHCP should be disabled on each of the access points. Now we want to segregate the networks. The idea here is that I don't want any device on the IoT/VPN Network to be able to access the Main Network. IoT/VPN Network should not be able to access the Main Network. IoT/VPN Network should be able to access the internet. 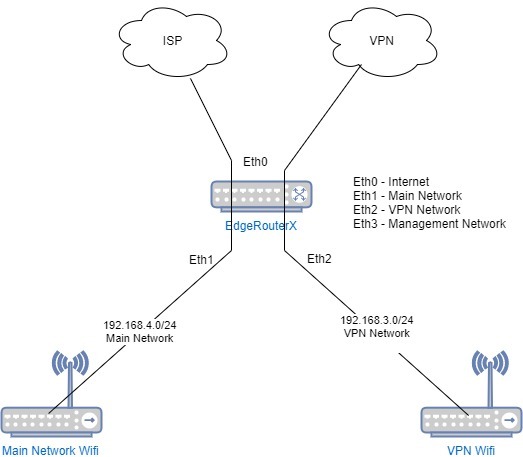 Io/VPN Network should not be able to access the EdgeRouter X. 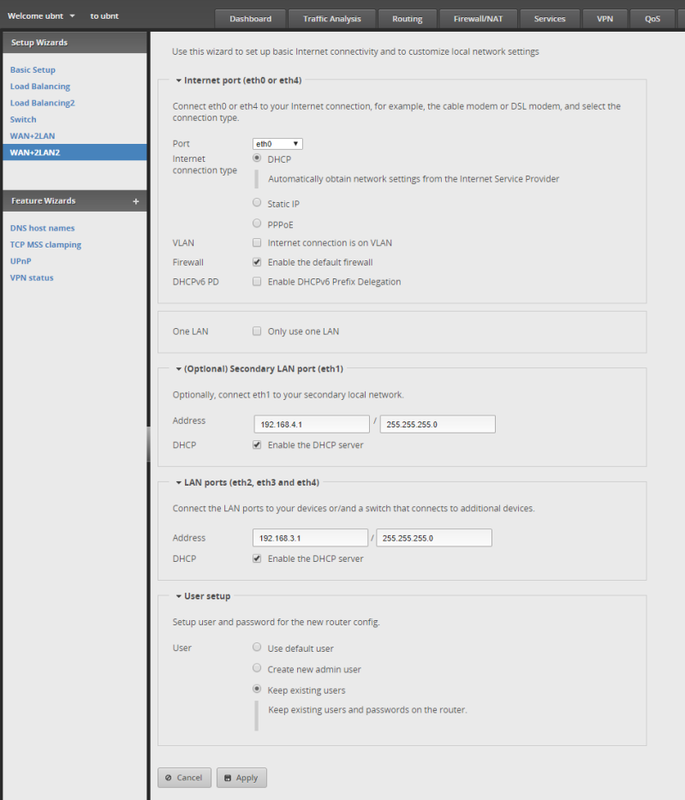 You are now ready to configure the router to use the OpenVpn configuration. For this next step, you need to SSH onto the router. You can see how to do this in the video. Reboot the router and you should now see vtun0 in the dashboard. Now we need to route traffic from the IoT/VPN Network through the established VPN. set firewall modify OPENVPN_ROUTE rule 10 description " Traffic from IoT to vtun0"
Create NAT rule for vpn. This is done in the GUI and instructions can be found in the video below.